Preferred Conditions: Echinacea prefers to be planted in locations with moderately fertile, well-drained soils. They do not perform well in locations with poor drainage or soils that remain constantly damp. Provide ample water during the first year after transplanting. 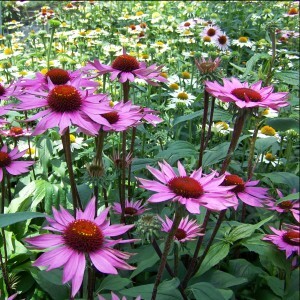 Once Echinacea are established (2-3 years) they are quite drought resistant. Coneflowers prefer to be planted in full sun, but also grow well under partial shade. When they are grown in a shadier location they will not grow as vigorously and fewer flowers will be produced. Maintenance: These exciting perennials are easy to grow and generally require few maintenance activities. Deadheading the spent flowers will promote additional blooming, but will not produce as spectacular flower display as the initial flush of blooms. Taller cultivars may need additional support from cages to prevent the flower spikes from lodging. Pinching them back in the late spring and not providing excessive nutrients will often eliminate the need for caging. Pests and Diseases: Some of the most common insect pests that may be observed feeding on Echinacea include aphids, caterpillars, grasshoppers, Japanese beetles, leafhoppers, and whiteflies. Most of these pests, under normal circumstances, do not cause significant injury to them with the exception of leafhoppers. Leafhoppers transmit a disease called Aster yellows which often causes the plant to appear abnormal (most notably the flowers often remain green and become distorted). Besides Aster yellows, Echinacea are also susceptible to powder mildew and root rot diseases. Uses in the Garden: Coneflowers are commonly used as accent plants or in mixed borders, open woodlands, and mass plantings. Coneflowers are also deer resistant. Other Uses and Attributes: This native of the eastern and central United States is widely used as an aromatic border plant to attract butterflies and birds in to the gardens. They are commonly used as cut flowers or in dried floral arrangements. When Echinacea are not cut back in the fall, the seed heads will provide added winter interest to the often barren landscape and provide a source of food for songbirds.